Expérience Années d'expérience en traduction : 10. Inscrit à ProZ.com : Aug 2014. Devenu membre en : Aug 2014. CV/Resume CV/résumé not public for privacy reasons. Professional background available on request. Pratiques professionnelles Thomas T. Frost respecte les pratiques professionnelles ProZ.com's - Liste des pratiques. 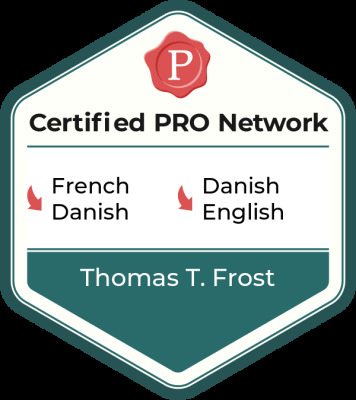 I am a former IT specialist and now a seasoned expatriate who has lived and worked in several western European countries and used English, French, and Danish as working languages in IT, freelance writing, translation, tourism and relocation. I was an IBM mainframe specialist for the first 20 years of my career, out of which 12 years with IBM. My specialities are IT, websites, user guides, administration, politics, correspondence, business and tourism. Apart from simply delivering a translation, I take pride in providing a personal, friendly, and reliable service. Organisation, punctuality, reliability and attention to detail come naturally to me. I kindly ask outsourcers to be aware that although I live in Germany, my typical working hours are mid-Atlantic, more precisely noon to 7 p.m. GMT. Outsourcers on the American continent should therefore not be discouraged by the geographic time zone difference. Open Monday to Friday except public holidays in Saxony-Anhalt, Germany. I have SDL Trados Studio and Kilgray MemoQ licences. No sale to consumers. This profile is not intended for users resident in Germany. Why?